Dr. Swiggum is a native of St. Charles. He was raised on a dairy farm and is a 1979 graduate of St. Charles High School. 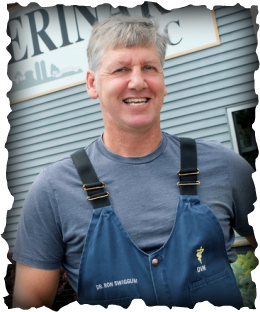 He received his undergraduate degree in Environmental and Public Health from UW - Eau Claire in 1984. He graduated from the University of Minnesota Veterinary College in 1989. In 2013, he received his Masters of Public Health degree from the University of Iowa. Dr. Swiggum joined the St. Charles Veterinary Clinic in 1990 and has been a partner since 1991. He specializes in dairy, beef and small ruminant medicine and surgery. He is an active member in the veterinary community. Currently Dr. Swiggum is on the Minnesota Board of Veterinary Medicine and is a member of the MVMA and AVMA. He married his wife Carol in 1984 and has three adult children, Sara (Andy) Walters, Mary, and Will, as well as one granddaughter, Caroline. He enjoys playing basketball, golf, traveling, farming, and spending time with his family. Dr. Jerry Berends is a native of St. Charles. He graduated from St. Charles High School in 1991. He did his undergraduate studies at the University of Minnesota and graduated from the University of Minnesota Veterinary College in 1998. 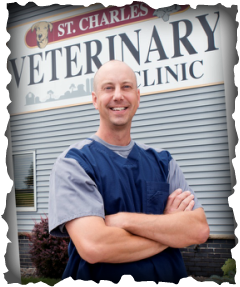 Dr. Berends joined the St. Charles Veterinary Clinic in 2000 and became a partner in 2004. His main focus is in small animal medicine and surgery, but also enjoys dairy and beef medicine and surgery. Dr. Berends is a member of the AVMA. He married his wife Amy in 1999 and has three children, Grace, Cole and Luke. They have two dogs, Ike and BB, as well as two cats, JJ and Millie. Dr. Berends enjoys watching his kids play sports, golfing, camping, and spending time with his family and friends. They have just added a new puppy to the mix, Maverick, the mini Australian Shepherd. Pam is a native of Eyota, MN and a graduate of Dover-Eyota High School - go EAGLES!! Her love of animals took her to the University of Minnesota - Waseca. She graduated with a degree in Veterinary Technology. 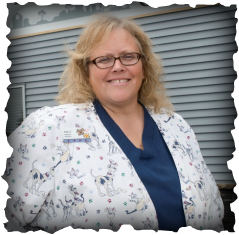 Pam joined the St. Charles Veterinary Clinic in 1985. Her favorite duties are dentistry, surgery, lab work, and ordering the drugs and supplies for the clinic. Pam shares her home with Bruce and her three and four legged kids - Mason, Lilly, Abby, Griffin, Snitzer and Charlie. She also has two miniature horses - Mr. Big and Devo. Pam enjoys gardening, fishing, bird watching, and spending time with family and friends. Stacy graduated from Dover-Eyota High School. She moved to St. Charles in May, 1991. 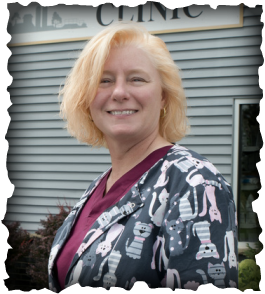 Stacy joined the St. Charles Veterinary Clinic in 1994. Her responsibilities include customer service and most of the office duties. Along with her husband Mark, Stacy shares her home with their dog, Kooper, and her cat, Hope. They have three adult children, Jim (Dana), Jake, and Jerricho. Stacy enjoys reading, traveling, and spending time with friends and family. 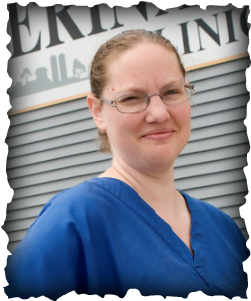 Erica joined the St. Charles Veterinary Clinic in September, 2004. Her duties include assisting the doctors, taking care of the pets in the boarding facility, cleaning, and customer service. Erica shares her home with her two children, Hunter and Olivia, and her cat, Katie. Her hobbies include reading, going for walks, and spending time with family and friends. Katie joined the St. Charles Veterinary Clinic as a full time groomer in December, 2016. Katie was born and raised in Byron, MN. She grew up on a farm showing horses and found her love for all different types of animals. She attended a grooming academy in 2012 and has been grooming ever since. Katie shares her home with fiance, Cole and her son, Weston. They have three dogs (Bailey, Lucy, and Heidi), six fish tanks, and one large habitat for their many hermit crabs. 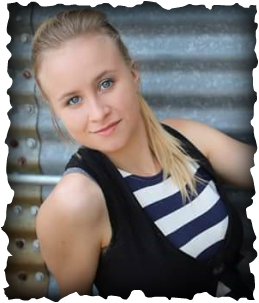 She enjoys spending time inthe great outdoors, camping, biking, and fishing as well as drawing and creating art. 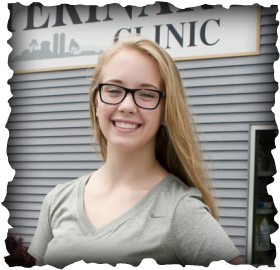 Shelby joined the St. Charles Veterinary Clinic in May, 2015. Shelby lives in St. Charles and is currently attending the Veterinary Technician program at RCTC. She was born in Rochester and raised in Spring Valley. She moved to St. Charles in 2014 after graduating high school. She shares her home with 2 cats (Manny and Dina) and her dog, Jake. Grace is a student at St. Charles High School. She joined the St. Charles Veterinary Clinic in April, 2014. Grace is active in volleyball and band. In her spare, she enjoys hanging out with her friends. She has a great love of animals and is considering going to veterinary school hoping to become the third generation veterinarian.